Google just officially released the Android 2.3 Platform SDK. Along with it, they have also officially announced the newest flaship phone, the Nexus S. This is probably not news to you, as there has been quite a bit of hype about both the new device and the new release of Android. I am here to tell you that neither of them really deserve the hype they have received. This phone is not particularly ground breaking. It is a decent device, but it’s not very exiting compared to everything that is out there already. Mostly because it’s built on the Galaxy S platform from Samsung that has now been released for quite a while all over the globe. It does seem to have a nicer display that is curved and also adds an NFC chip and a gyroscope that other Galaxy S models lack. However it is missing a few somewhat more important features. I am of the opinion that expandable storage is a nice advantage that many phones have over the Apple branded ones. Granted, 16GB will be sufficient for most folks, it is the option for expansion that is really appealing. I don’t see NFC capabilities taking off for quite some time, though it is a welcome addition and I hope to see it become standard from here forward. Not only is anything less than a 4G capable device an utter joke at this point, this thing doesn’t even support T-Mobile US’s HSPA+ attempt at catching up. Finally, lack of trackball or similar input method is debatable, but until input selection is improved dramatically it is a necessary evil on Android phones. Now for the real meat of my argument. I want to be clear that Gingerbread will bring some welcome improvements and a lot of the focus for Android 2.3 has been geared towards developers with fundamental API improvements and better support for building games on the platform. You won’t see many drastic UI improvements across the board, however, it does seem like most of the features for end users are already available in CyanogenMod 6.1. I would like to take this opportunity to highlight some of the features available today in CM6.1, a few of which will not even be available in Android 2.3. 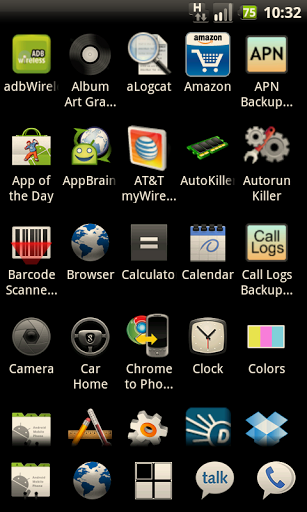 As you can see in the above screenshots, I have a Google Nexus One/HTC Passion running CyanogenMod-6.1.0 which is built on AOSP version 2.2.1 build FRG83. You might also notice that the kernel is of the 2.6.35 branch which will be standard in Gingerbread. I get amazing battery life running CyanogenMod on the N1. 24 hours seems to be about the going rate for most smartphone users, but I seem to get almost two days out of my N1. You might notice that all of my screenshots seem to have a slightly off shade applied to them. This is a feature built in to CM releases labeled “Render effect” for OLED displays. The CyanogenMod team have integrated Jeff Sharkey’s patches for filtering certain colors to reduce battery drain. 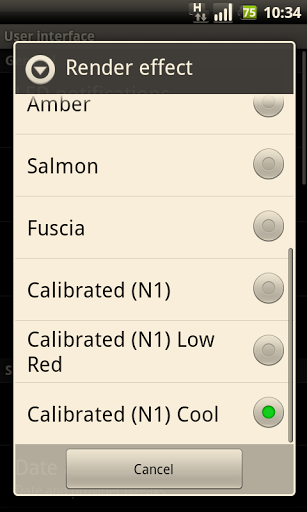 They have also integrated an effect selection menu in to their own settings panel while providing a few optimized effects for the Nexus One. 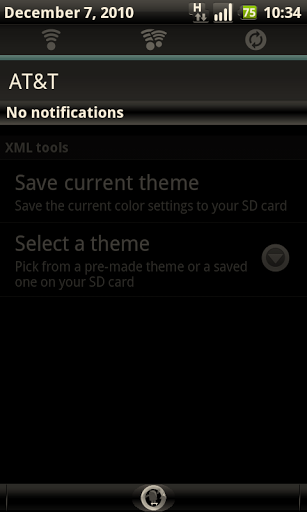 Another really nice feature of CM6.1 is the inclusion of power management widget buttons in the notification drop down. 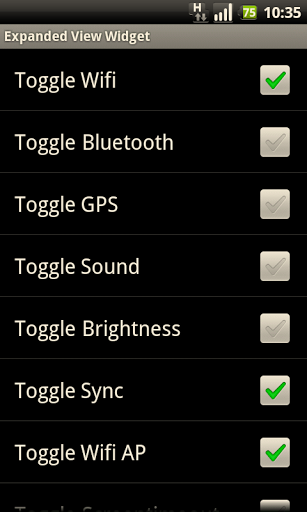 You can access this feature from Settings > CyanogenMod Settings > User interface > Widget buttons. 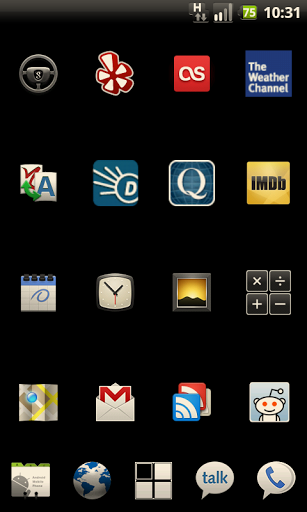 You have a ton of options to choose from and can decide which toggles are most useful to you. 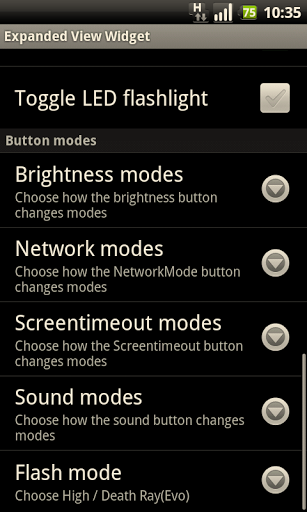 Some of the toggles even have multiple modes to choose from like having the brightness toggle between Auto/25%/100% or Dim/100% or Auto/Dim/40%/100%. There are just so many great features of this ROM that I couldn’t possibly have the time to go into depth about all of them. There are quite a number of improvements to the stock camera, some of which look like they’ve made their way into Android 2.3. FM Radio support has been added (for certain devices). You won’t see that in 2.3. Notification “quiet hours” are wonderful for setting a period of time that your phone won’t make any noise (like when you normally sleep). Lockscreen gestures for assigning specific tasks to gestures without even unlocking the phone (like calling a lady friend with a heart shape). You should check out the changelog of features to see for yourself and then visit the wiki for instructions on how to get CM6.1 on your own device. Don’t be a chump. You already bought an Android device, now get the most out of it from a community that makes ROMs for you. These are folks who use the same devices as you do and want the same things you do out of their devices.